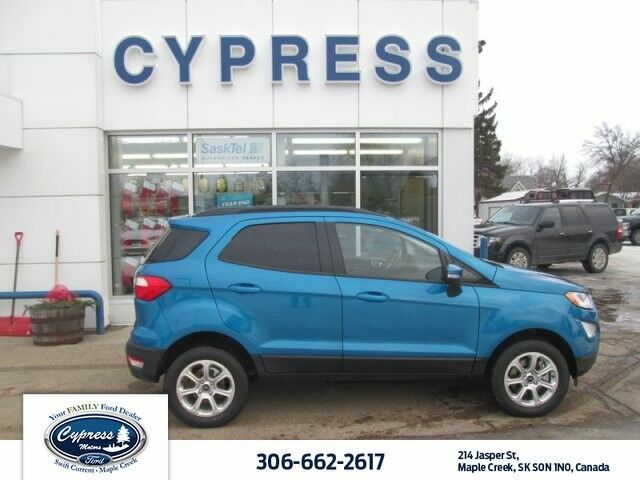 2018 FORD FUSTION SE FWD, 1.5L I4 6-SPD AUTO, HEATED FRONT SEAST, LANE KEEPING SYSTEM, BLIND SPORT DETECTION, LOCATED AT MAPLE CREEK, SK., CONTACT CORY OR DALE AT 1-877-662-2617, 306-662-2617, OR EMAIL THEM AT cpenner@cypressmotors.com or dlockard@cypressmotor.com. WE FINANCE! ON SITE BAKING SOLUTIONS! FORD MAINTENANCE PROTECTION PLAN AND EXTENDED FOR PROTECT PLANS AVAILABLE ONE STOP SHOP WITH SALES AND SERVICE, SERVING SOUTHWEST SK. FOR OVER 45 YEARS. Contact Cypress Motors today for information on dozens of vehicles like this 2019 Ford Fusion SE. This Ford includes: EBONY, HEATED CLOTH FRONT BUCKET SEATS Vinyl Seats Split Bench Seat Cloth Seats Power Passenger Seat Power Driver Seat Fixed Bench Seat Leather Seats Driver Adjustable Lumbar Premium Synthetic Seats Bucket Seats TRANSMISSION: 6-SPEED AUTOMATIC (STD) Transmission w/Dual Shift Mode A/T 6-Speed A/T EQUIPMENT GROUP 150A WHITE GOLD METALLIC FORD CO-PILOT360 ASSIST Cruise Control *Note - For third party subscriptions or services, please contact the dealer for more information. * Put away your phone and focus on the road, your new vehicle has navigation. This is about the time when you're saying it is too good to be true, and let us be the one's to tell you, it is absolutely true. You've found the one you've been looking for. Your dream car. This outstanding example of a 2019 Ford Fusion SE is offered by Cypress Motors. This Ford includes: TRANSMISSION: 6-SPEED AUTOMATIC (STD) Transmission w/Dual Shift Mode A/T 6-Speed A/T EQUIPMENT GROUP 151A Fog Lamps Chrome Wheels Tires - Front Performance Aluminum Wheels Rear Spoiler Steel Wheels Leather Steering Wheel Tires - Rear Performance ENGINE: 1.5L ECOBOOST (STD) 4 Cylinder Engine Gasoline Fuel Turbocharged LIGHT PUTTY, HEATED CLOTH/VINYL FRONT BUCKET SEATS Vinyl Seats Split Bench Seat Cloth Seats Power Passenger Seat Power Driver Seat Fixed Bench Seat Leather Seats Driver Adjustable Lumbar Premium Synthetic Seats Bucket Seats RICH COPPER METALLIC TINTED CLEARCOAT FORD CO-PILOT360 ASSIST Cruise Control *Note - For third party subscriptions or services, please contact the dealer for more information. * The Ford Fusion SE will provide you with everything you have always wanted in a car -- Quality, Reliability, and Character. This vehicle won't last long, take it home today. You can finally stop searching... You've found the one you've been looking for. Contact Cypress Motors today for information on dozens of vehicles like this 2019 Ford Mustang EcoBoost. This Ford includes: ENGINE: 2.3L ECOBOOST (STD) 4 Cylinder Engine Gasoline Fuel Turbocharged VOICE-ACTIVATED TOUCHSCREEN NAVIGATION SYSTEM Navigation System EBONY, CLOTH BUCKET SEATS Cloth Seats Bucket Seats EQUIPMENT GROUP 101A Multi-Zone A/C HD Radio Tires - Front Performance Aluminum Wheels Rear Spoiler A/C Climate Control Rear Parking Aid Power Passenger Seat AM/FM Stereo Power Driver Seat Satellite Radio Tires - Rear Performance Premium Sound System Auxiliary Audio Input Driver Adjustable Lumbar MP3 Player TRANSMISSION: 10-SPEED SELECTSHIFT AUTOMATIC Transmission w/Dual Shift Mode Locking/Limited Slip Differential A/T 10-Speed A/T EBONY STRIPE BLACK ACCENT PACKAGE Tires - Front Performance Aluminum Wheels Rear Spoiler Tires - Rear Performance NEED FOR GREEN *Note - For third party subscriptions or services, please contact the dealer for more information. * This is about the time when you're saying it is too good to be true, and let us be the one's to tell you, it is absolutely true. This is the one. Just what you've been looking for. Just what you've been looking for. With quality in mind, this vehicle is the perfect addition to take home.